An average hummingbird beats his wings about 30 times per second! That translates to a healthy metabolism, which means they must consume their own weight in nectar each day. The Oval Hummingbird Soap Mold is a beautifully detailed depiction of this amazing creature filling up on some trumpet vine nectar. 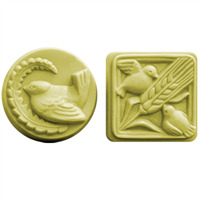 "Milky Way™ Hummingbird Soap Mold (MW 107)"
COMMENTS: My honeysuckle soap looked perfect when I unmolded this one. Loved it. COMMENTS: True to mold, but isn't silicone. COMMENTS: Makes 3-4 oz. bars. Very pretty design. Everyone loves this. The mold washes easily, warm water. Unmolds easily, freeze for a few minutes then gently push your bars out. COMMENTS: This mold makes some beautiful soap designs. 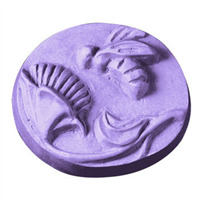 I like it for that as well as being a 4 ounce mold which I try to keep my soaps around that weight. Customers have liked this design. It is typical milky way quality and I do enjoy using their molds. "This mold is a winner"
COMMENTS: I was delighted with this mold. 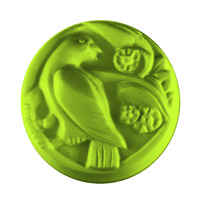 The design is very detailed and makes three beautiful bars of soap, which look very expensive. The mold is made of plastic but the soap easily pops out once you let a little air in on the sides and apply gentle pressure to the back of the mold. The plastic is sturdy and it was really worth the money. I usually prefer silicone molds, but they can be expensive. This mold gives me three expensive-looking full-sized bars of soap at one time and the price is very reasonable. I plan to order more of these and have my eye on the Koi Fish mold right now. Free shipping only makes the deal sweeter. "What are the dimensions of these molds? Thanks!"